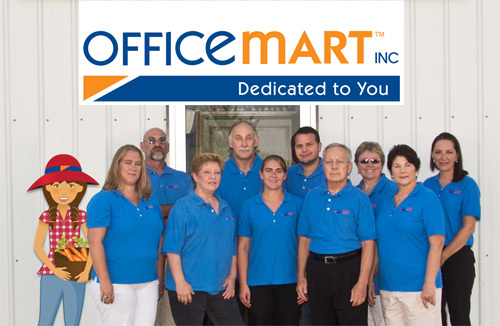 Office Mart, established in 1977, is the fastest growing independent office products dealer in the Central Ohio area. Owners Pat and Susie Blake have lived, worked, and contributed to their community for over 35 years. Headquartered in Lancaster, Ohio, Office Mart is able to serve companies throughout Southern and Eastern Ohio. For customers headquartered locally but with offices around the country, our distribution network allows us to ship products for next day delivery to offices anywhere in the United States. Our extensive product offerings include general office supplies, furniture, technology products, and break room and janitorial supplies. Office Mart is dedicated to the needs of each customer and knows the value of a single-source supplier to save you soft and hard dollars, helping you be more efficient, lowering operating costs, and ultimately be more profitable. By remaining a local-independent dealer, we are committed to supporting the community where our customers live and work. You’ll find us in Athens, Circleville, Newark and all the places in between. We pride ourselves on our dedication to you through building successful working relationships and giving local, personalized service at competitive prices. We realize your time is valuable. Our team of knowledgeable professionals is always ready to answer your questions and find the right solutions for your company.